In the Doc McStuffins Appisode featuring “Kirby and the King & Karate Kangaroos” preschoolers experience the magic of watching, playing, and interacting directly with their favorite Disney Junior TV show in a whole new way! Separation anxiety! It’s a three-legged-race to Doc’s clinic when Sir Kirby and the Evil King get glued together! 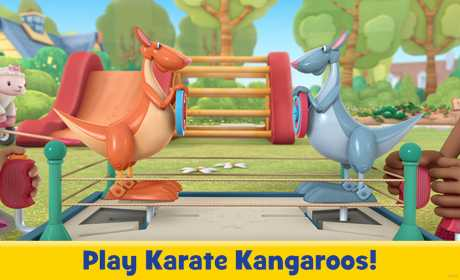 Help Angus the Karate Kangaroo get over his fear of conflict and hop back in the ring! • Help Kirby chop down the Evil King’s sandcastle! • Help Doc perform a sticky operation! • Help Angus get his bravery back! • Square off in a game of Karate Kangaroos!